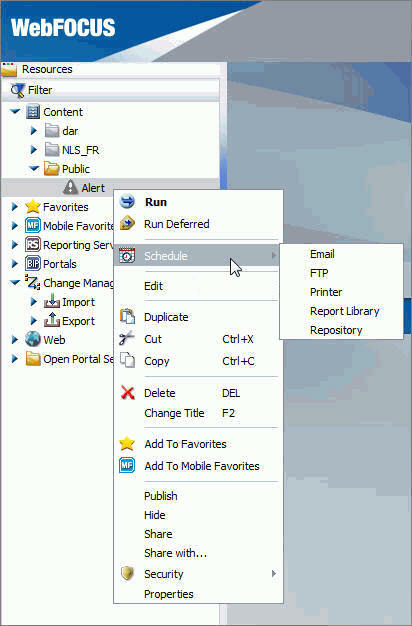 In the Resource tree, right-click the Alert, point to Schedule, and select how the Alert report will be distributed when the Alert test is triggered (true), as shown in the following image. The ReportCaster Basic Scheduling tool opens in a new browser window, as shown in the following image. For more information on the Basic Scheduling tool and distribution options, see the ReportCaster manual. Continue After Alert. This option continues to run the schedule at the specified time and distribute the report each time that the Alert test is true. It is best to use this option when you want to be notified at the interval specified in the schedule that the Alert test is true. Delay. This option is best used when you want to allow a specific period of time to address the Alert test but want to be notified again if the Alert test has not been met. You can restart the Alert after a maximum of 99 hours, days, weeks, months, or years. Select the Properties tab and type a title and summary for the scheduled report. For more information on Recurrence options, see the ReportCaster manual. Click Distribution and specify the destination information for where you want the report to be distributed. For more information on specifying schedule distribution information, see the ReportCaster manual. If you wish to receive notifications of the Alert distribution, click Notification and specify the destination information for where you want the notification to be sent. If your Alert uses parameters, check Parameters to review and specify parameter values. Ensure that you have the correct Path, Procedure, and Server Name. 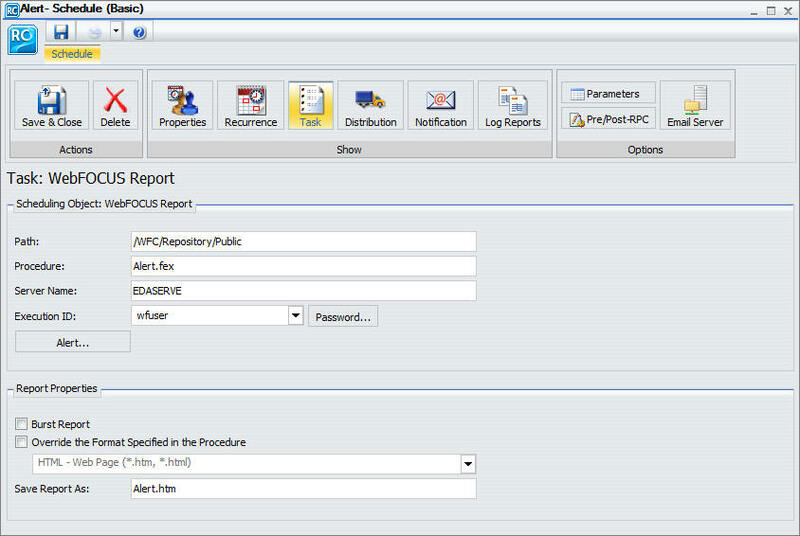 For more information on specifying parameter values when scheduling a report procedure (FEX), see the ReportCaster manual. Click Save and close the ReportCaster Basic Scheduling tool. The schedule report now appears in the Resource tree, as shown in the following image.